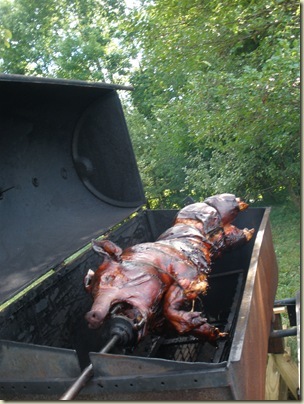 Pig Roast means pork right? Then there was the pig. Oh the pig! Scary to look at, moist and delicious and tasty! That was a lot of pork, but I ate as much as I could and then snacked all night! My younger cousin and his friends were there too. The young guys thought that the keg would be lonely if they did not keep it company. To do so they decided to do “keg stands.” I had no idea what this was—I went to an all women’s college-We drank profusely but never standing on our heads. Our university taught us all about gravity. 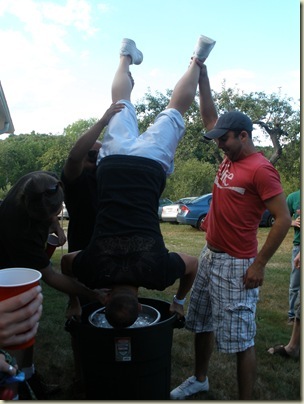 “Keg Stands” are when you tip yourself upside down, other people hold your legs steady and you drink directly from the keg tap-while upside down. This particular guy upped the challenge and started doing upside down push-ups while drinking beer upside down. Wowza! I was able to eat copious amounts of food, mostly slow roasted pork, scarf paella and hang out with my cousins all night. It was a wonderful time and an awesome party! 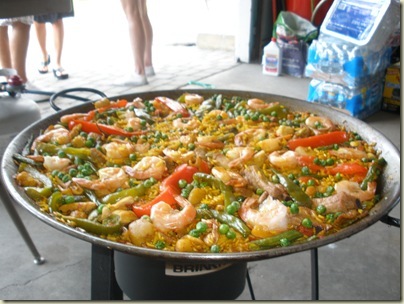 This entry was posted in Cousin, Family, New Hampshire, Party and tagged Cooking, Expat, Pork, United States by Jules. Bookmark the permalink.